Sky reveals new EPG and exclusive HBO deal | What Hi-Fi? Sky has released the first image of a new-look homepage for its Electronic Programme Guide (EPG), while also revealing a renewed and extended deal with US content producer, HBO. The news comes as Sky releases its Q2 2014 results, which show record growth for on-demand viewing in Sky homes and adjusted revenue for the company as a whole up 8% to £3,751 million in the first half of Sky's financial year. 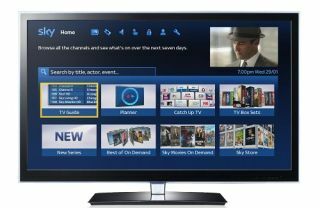 Sky now has 4.4 million 'Connected homes', with the company claiming to be 'Britain's most popular connected TV platform' based on more than 450 million on demand requests on Sky+ HD TV boxes in 2013, double the number made in 2012. Sky Go, Sky's mobile viewing platform, also grew to 770 million on demand requests in 2013, up from 590 million in 2012, totalling 1.2 billion on demand programme views in 2013, averaging 38 requests a second. The new-look homepage for the EPG, said to be rolled out this spring, responds to this change in viewing habits by giving greater prominence and quicker access to the Catch-Up TV, On Demand and Sky Store sections of Sky TV. The cleaner design also has a larger, more obvious search bar and a dedicated section for New Series. Sky confirmed it has renewed its deal with HBO, the company which produces many of Sky Atlantic HD's most popular US dramas, such as Boardwalk Empire and Girls (above), ensuring Sky will be the exclusive home of HBO in the UK and Ireland for a further six years. The deal will also see the two companies working together to produce new content.